Most of us bloggers feel compelled to write every week because we simply love to write. I thought it would be interesting to take a look into the mind of an 8-year old boy to see if my son Jake were to have a blog, what would he write about. These writings are scanned directly from his work so you can see the way he spells, writes and the comments from his teacher. This first one was a writing assignment that looks like it was connected to a book they read in class. I have no idea what book it was but I sure did appreciate Jake’s imagination about how to ‘fix’ the problem with the dog. Please know before reading this writing assignment that after we read this, we thought there was a chance Jake was trying to say something about the way he views himself. He uses the words ‘fat,’ and ‘ugly’ many times. Trying to be a good parent, I had a conversation with him to see if he was using these words as reflection of how he thought about himself. I’m proud to say that when asked what words he would use to describe himself, Jake answered, “smart, good athlete and funny.” Good to know … Jake doesn’t have a self-esteem problem. He has an ‘8-year-old boy’ problem. 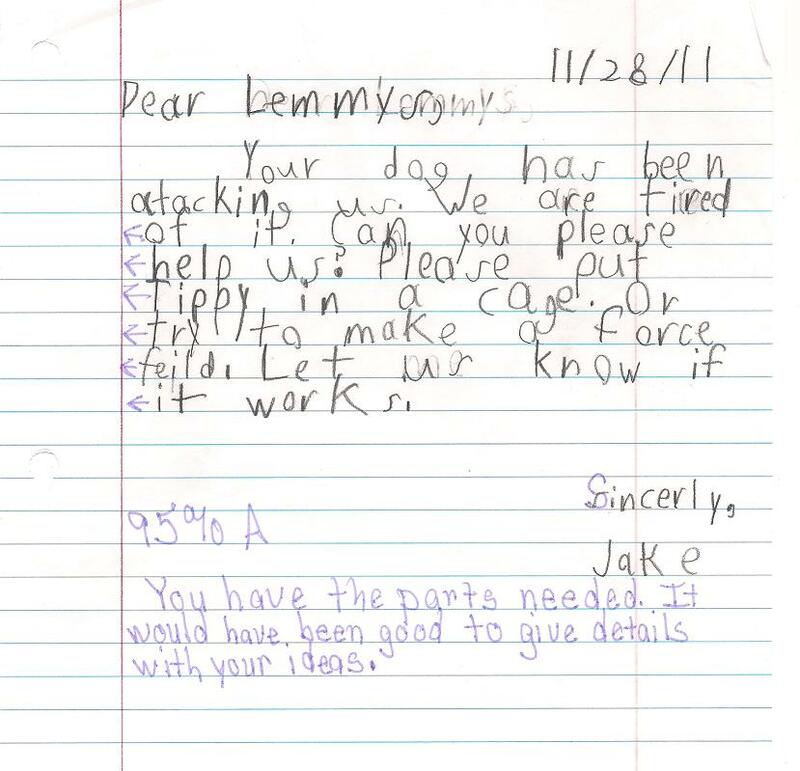 This last one is proof of my belief that Jake is a lawyer in training. 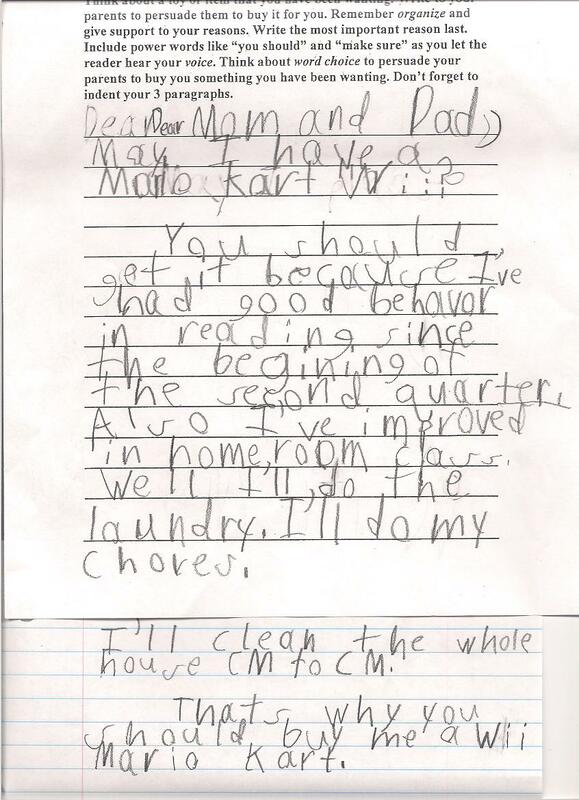 This is Jake’s argument for why he should get a Mario Kart Wii. When I asked him what CM to CM meant, he said it was centimeter to centimeter. And notice he writes this to both parents even though he knows we live in two different homes. Guess he was trying to take a shot to see which one of us would go for it and buy the Wii for him.